I’ve pulled out the old blog posts about movies, and start putting the cinema material here. You’ll no doubt notice that I’ve given this page the name of the journal where Godard, et al. got their start. I promise this is one of the few times I’ll use French. I finally found a picture of the old Circle Theater at 21st and I NW. When we were first married we lived across the street in an efficiency with terrible plumbing. In 1968 we moved to 24th & H NW, but we still managed to go to the Circle on a regular basis. 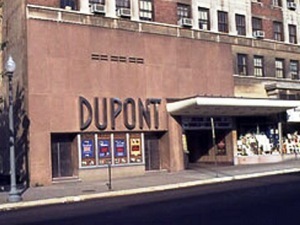 ￼The picture to the right is the Dupont Theater in DC. My film education took place mostly at the original Circle, but I have fond memories of this one too. I think I’d dated one or two other girls just prior to starting at GW, but I took a pretty red-headed girl, whom I always refer to as Liz, but who actually went by Elizabeth, to see a movie. As I recall I was short a dollar, and she had to lend me money. Afterwards we parked outside her dorm, and I did my first bit of serious necking. That’s one part of my education that we won’t be dealing with too much. ￼Strange, wanton women with flowing red hair are not the only ones that I associate with movies and theaters. There’s a picture of the Biograph Theatre at 29th and M NW. I took my wife there on our first date, and we saw Boudu Saved From Drowning . After the movie we walked up Wisconsin Ave, and stopped by this store that had a sitar in the window, and had our first kiss. Afterwards we walked back to her apartment, stopped off at Gillie’s 21, the liquor store adjacent to the Circle, where I bought a bottle of chianti. We drank the wine, but didn’t have liver or fava beans.